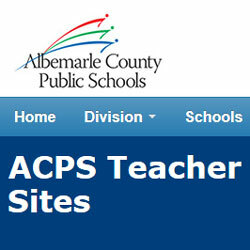 Teacher Landing Pages are no longer required by ACPS, and we are beginning the process of transitioning away from those sites hosted on the ACPS website (a.k.a., “SharePoint”) at https://www3.k12albemarle.org/teachers. Links to all old SharePoint-based landing pages will be removed from School Staff Directories on November 16! Teachers are still free to create externally-hosted websites as well. Visit Options for Teacher Web Sites for more information, including how to request a WordPress site, guidelines for Google sites, and branding requirements for externally-hosted sites. Assistance migrating content from SharePoint to WordPress is available upon request. Simply check that option on the form when requesting your WordPress site. NEW! Teachers can now edit their own Staff Directory web link! When your new site is ready to “go live,” you can now add your link to your School Staff directory listing. Learn how on our Web Help site.